After the 3rd time I stretched my neck out to see what was going on and there was a homeless man sleeping. From what I could see, he had an injured foot and had urine flowing from seat to seat next to him. So,,, two stops later, 3 police officers enter the train and did nothing!!!!! They did not even look or turn towards him! *I thought they would at least help him, talk to him, see if he's alive ,,,,something! Anywayz, I get close to my destination .... the police have left, and the train empties out and I see a young woman go up to the man, wake him up, give him a couple of dollars, her breakfast, and a business card. *hopefully she was able to help this man out -- even if it was just with coffee. 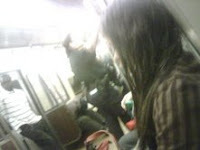 The photo below features one of the officers chatting and the homeless man sleeping behind her.